Life's Tips and Tricks: A Real Treat From Cebu Pacific! 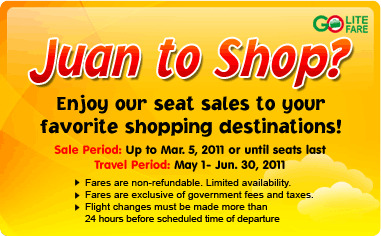 I was astonished receiving this seat sale alert from Cebu Pacific! This is really an up for grab sale! 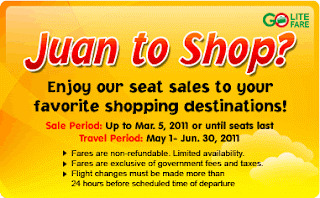 Yes, going to shopping destinations Hongkong and Bangkok is no longer a dream. Imagine flights from Manila, Cebu or Clark to Hongkong for as little as P1,499 and as low as P1,999 "Go Lite" from Manila or Clark to Bangkok. So what are you waiting for! Grab a seat now!